A group of teenagers has been interrogating me for almost an hour. “Can you prove you are who you say you are?” one of them asks. “Show us the tear stains on your diploma to prove you actually went to U Chicago,” another says. I don’t have the tear stains. But I do have a Twitter account with my name on it, and enough memory of my time at college to offer convincing details that I actually attended the University of Chicago as an undergraduate. Eventually the group provisionally agrees that I am real. They have good reason to be suspicious: This team of about 40 incoming freshmen, who call themselves the Secret Squids, have spent more than a month investigating something called PS, a secret society that has existed at the University of Chicago for more than a century. 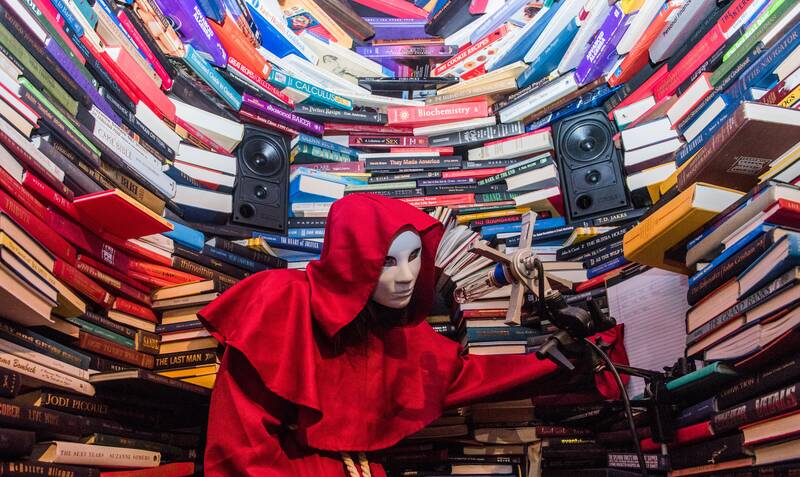 Led by the Reticulites, 11 masked monks clad in red robes, the purpose of PS is to track the Parasite, a mysterious force that appears on campus once every 11 years in the form of a misplaced, miraculously conjured room. Eventually the Squids discovered the unsettling fact that the secret society had planted several fake students among their number: By the time I joined them in August, paranoia had become the norm. To complete their initiation and become full members of PS, the Squids—as well as everyone else in the 1,800-plus class of 2021—were invited to spend their first week on campus finding 121 objects that would help them activate the Ruun, a sort of supercomputer capable of ascertaining the location of the Parasite. But there was no PS, no Parasite, no Ruun—at least not at first. It was all an elaborate fiction: The students were playing an alternate reality game. Like most freshman orientation programs across the US, one of the goals of this game was to bond first-year students in a way that would leave a lasting mark. But its aims went well beyond that tradition. The elaborate game was designed to make first-generation, low-income, queer, and otherwise marginalized students feel more accepted at the university—more comfortable taking advantage of its prodigious institutional resources. It also sought to foster a healthy intellectual environment where a variety of perspectives and ideas could coexist. In short, The Parasite was an attempt to upend the established norms of orientation and in the process change what it meant to be a student at the University of Chicago. An alternate reality game is, more or less, exactly what it sounds like: a constructed world with a fictional history that layers on top of the “real” world, enticing players to investigate mysteries, solve puzzles, and communicate with characters in the game (who do not identify themselves as such). The people who happen upon entrances to this new world (“rabbit holes”) are invited to wonder what is happening, if any of it is real, and to actively push back against the boundaries set by the architects of the game. The best alternate reality games succeed in blurring the lines between life and the game. The earliest ARGs took place almost entirely online—the form dates back only to the turn of the century—when encountering shady, mysterious characters on the internet still felt like a raw, Matrix-like possibility. They are also, often, marketing campaigns. The first major ARG was 2001’s The Beast, a game that enticed players to engage with various communication formats—phone messages, online video, fliers, and the occasional live event—to unravel a murder mystery. It was designed by Microsoft to promote the film A.I. Another early game, 2004’s I Love Bees, amassed a vast network of players in the service of getting them excited about the release of Halo 2. That these rich experiences are usually part of an ad campaign is, for the moment, central to ARGs. The reason is simple: They’re expensive. The Parasite is no exception, although its funding—about $250,00—didn’t come from marketers. Instead, it was cobbled together from a variety of sources (including a grant from the Neubauer Collegium for Culture and Society, several fellowships for student workers from the College, the university’s Committee for Theater and Performance Studies, and a University Arts Grant) wrangled by a team led by Patrick Jagoda, a professor of English and cinema and media studies at U Chicago. He's also one of the cofounders of Game Changer Chicago, a lab that designs digital games, board games, and ARGs for Chicago high school students. Jagoda’s enthusiasm is boundless—for games, for television, for books. (He studied with David Foster Wallace, and lived with him for a summer in the mid-‘00s. They went to a midnight screening of The Matrix Reloaded. Wallace reportedly hated it, while Jagoda defended the Architect—himself a kind of proto-ARG designer—as a clever use of the work of French theorist Jean Baudrillard.) Jagoda was also one of my teachers: I took multiple classes with him when I was an undergraduate at the university, and I was one of the more engaged players for The Project, the last ARG he ran on campus, in 2013. (He has worked on seven other ARGs.) As a result, I was not exactly an objective observer for The Parasite—but no one really could be. This is part of what appeals to Jagoda about the format. Simply interacting with players and maintaining the fourth wall would of necessity make me a character in the game, even if that character was almost identical to the “real” Eric Thurm. The nature of ARGs is to be infectious and immersive, assimilating people, places, and events into their narratives like a sort of playful Borg. Jagoda conceived of the project that became The Parasite while on a road trip with his partner, U Chicago sociologist Kristen Schilt, who ran an ethnographic study of freshman orientation in 2016 to identify spaces where a game would make sense in the Orientation Week experience. The pair also brought in Heidi Coleman, director of undergraduate studies in the university’s theater and performance studies program, to oversee the performance elements of the game. The university that’s sometimes called the place where fun goes to die has an odd relationship to play. The administration encourages Scav, an annual scavenger hunt that has been running since 1987, where hundreds of students compete to do everything from building a nuclear reactor to summarizing The Wire solely through cannibalized clips from The Lion King. Some people consider Kuvia, a week of 5 am wakeups for yoga and stretching, a “fun” tradition. Even the university fight song references Thucydides. In other words, it’d be difficult to find a campus better prepared for a meta-fictionally slippery, puzzle-based conspiracy. The Squids certainly embraced it. And as they coalesced into a tight-knit group of students (about 20 in the core group solving many of the harder puzzles, with more than 100 floating around in various side chats), they became more willing to play back against the design team—that is, to stretch the boundaries of what The Parasite could be. The design team, for its part, went along with the fun. For example, a Facebook post by incoming student Katie Delong asking if any other members of the Class of 2021 played Dungeons and Dragons prompted the design team to create a specialized, 35-page, Parasite-themed D&D campaign. Three other examples: Mateo Rey, a first-year student from Argentina, cracked a series of codes produced by bots in the Squid’s Discord room (an online chat service primarily used by gamers), allowing the students to create their own bots. The Squids set up fake email accounts to communicate with Adrian, a suspicious shill character created by designer Jesse Martinez. And during orientation, one of the Squids made a Grindr profile for one of the Reticulites, who the Squids affectionately named “the Grindticulite.” Unbeknownst to the Squids, members of the design team had joked for months about creating a Reticulite Grindr profile. Then there was the time over the summer when two incoming freshmen who happened to be in Chicago interpreted a vague message from one of the game’s characters to mean they should head to campus. Sneaking into the university’s Reva and David Logan arts building, they stumbled on in-progress sets for The Parasite—a moment that could have cracked the shell of plausibility around the game. Instead, it prompted the design team to create a new character who was, in the narrative of The Parasite, in charge of construction. The arts building, the hub of design team activity, was also the site of the first live event for The Parasite. During an O-Week kickoff party, the Reticulites paraded through the building, announcing the presence of PS and prompting participants—known as Seekers—to scatter to several rooms and adjacent buildings, where they encountered puzzles ranging from a Zelda-style trading game to an enormous, linguistic Rubik's Cube made out of cardboard boxes. All paths led students to an on-campus rave, complete with pizza, glow sticks, and a DJ. At the end of the dance party (when the DJ played “Mr. Brightside” by The Killers), they were led to the first activation of the Ruun. Blurred lines between player, character, and designer led to the creation of chats-within-chats, and several levels of secrecy: The main “Secret Squids” group focused on puzzles when one was active and memes when one wasn’t. “Super Secret Squids” was created as a space to hide from PS—it included more personal conversations and investigations that largely consisted of Facebook-stalking members of the design team. A third “Conspiracies” group was devoted to piecing together the “reality” of the project, collecting articles on Jagoda and Coleman’s work as well as ARGs in general. The split between “Super Secret Squids” and “Conspiracies” happened so that Seekers could more easily maintain the fourth wall, allowing some of them to simply play The Parasite on its own terms. As the game got rolling over the course of orientation week, Seekers were presented with several different schools of thought regarding how PS—the society they were trying to join—should be run. Most of the characters they met were in the Owl, Serpent, and Squirrel sects, loosely organized around academic disciplines—STEM, performance, and humanities, respectively. Eventually they were exposed to the division between Ana Mead, a disgruntled former PS member played by recent U Chicago graduate Zoë Smith, and Jesse, the seemingly ageless founder of PS played by graduate student Bill Hutchison—a conflict that originally seemed to structure The Parasite’s narrative before ending in intentional anticlimax, with both sides agreeing to peacefully coexist. This notion of peaceful coexistence was key to the game—with a twist. The designers wanted the players to grapple with issues of diversity, especially in situations where consensus might never be achieved. So they built the game on the principle of “dissensus”—the idea that people can and should be comfortable reaching an impasse and allowing clashing views to thrive in the same place. The UCPD has a history of racial profiling, pushing away kids from the neighborhood who want to access the university’s resources and expressing skepticism and hostility toward students of color and their families. Rapid development led by the university has plowed through local businesses in Hyde Park—a neighborhood, like many in Chicago, still feeling the effects of decades of redlining—and transformed it into an odd island in a city, something resembling a gigantic mall. Dissensus permeated the rest of gameplay during orientation week. During The Parasite’s “hospitality” cluster on Wednesday, about 50 students met at the university’s Center for Identity and Inclusion. Across the street, hundreds more lined up for a housewarming at the university’s Institute of Politics, where conservative New York Times columnist Bret Stephens of the advisory board. At this event, Seekers were given pizzas to deliver to professors, and encouraged to take it slow and simply hang out with the assigned faculty members. “There are a bunch of students who feel really uncomfortable and anxious about having face-to-face interactions with faculty when they first arrive,” Jagoda says before the cluster begins. “In my experience, that happens more often with first-generation students than with students who have more privilege.” Making the challenge about slow-paced, laid-back conversation—a sharp contrast to the intensity of the ordinary university environment, and to the rest of The Parasite—was also intentional. “They’ll have a chance to just stand around and talk,” Jagoda says. I followed a pizza delivered to Susan Gzesh, the executive director for the university’s Pozen Family Center for Human Rights. Gzesh took the opportunity to highlight dissensus, or “being comfortable with the existence of different narratives and different points of view,” as she put it. “Human rights tends to be about that,” she tells the students, explaining the field as a sort of dialogue between universalism and cultural relativism before showing them a series of photos of her father’s family getting married in a mass ceremony in a ghetto and talking to one of the students in Spanish about human rights work in Mexico. After they returned to the Center for Identity and Inclusion, the event concluded with a simple icebreaker exercise that encouraged students to identify several possible facets of their identity, including being a first-generation college student, the different ways they could relate to their pronouns (one student invited the first-years to ask about gender-neutral pronouns; Hsu, who prefers she/her pronouns but is often referred to with he/him or they/them by other people, expressed ambivalence about putting in the necessary effort to correct the error), and owning cats. The Marketeer, a character in the game occupying multiple bodies, introduced themselves with preferred plural pronouns. A few minutes later, a prospective pre-med announced that he was interested in theater, tennis, and videogames—to an equally positive response. The circle gave the designers, some of whom had been playing characters within the game for weeks, a space to discuss their lives outside of the game, and it gave the first-year students a demystifying peek behind the fourth wall. The Marketeer may have been a character occupying two bodies, but they were also people working to give the freshmen a unique, shared experience. The Seekers were in the process of PS initiation, but they were also nervous kids in their first week of college, looking to make connections with other people. The warmth and intimacy in the room was palpable. The Parasite continued for several days, ramping up the presence of PS in various locations on campus. One puzzle hunt on Thursday taught students how to use the university’s intimidating, brutalist Regenstein Library, transitioning into a brief tour of an underground library maintained by giant robot arms—one of which brought Seekers an object they had been seeking. That night there was also an interactive screening of The Cabinet of Dr. Caligari held at Rockefeller Chapel, where students were given programs with a distinct set of directions for how to respond to the movie and encountered an original ending. But the most tense moment of The Parasite took place entirely online. On Friday the second to last day of play, Mateo Rey, one of the Squids who had been part of the game the longest, appeared in their GroupMe chat: “So I should probably come clean about something,” he said, before changing his name to “Adrian 2”—the name of one of the design team shills—indicating that Mateo was not, in fact, a real person. He was yet another false identity, created by designer Jesse Martinez. The Squids were furious. They had uncovered the identities of several design team plants, but Mateo had not only managed to evade being unmasked through the summer, he had access to to the Super Secret Squids chat—the space created for the Squids to talk free of the prying eyes of the design team. “This was the chat we made to avoid PS, and they were in it the whole time,” says Natalie Wang, one of the most active members of the Squid groups (even though she had deferred enrollment for a year and participated in the game entirely online). There was also a more personal worry. “Now they’re going to know how much I stalk their Facebooks, and they’re going to find that creepy,” Wang says. Weston single-handedly orchestrated an organic subplot in the game, running with a misunderstanding that involved several Squids thinking she had stolen a geiger counter from the Ruun. Weston began conspicuously carrying the geiger counter around with her, won over most of the players to her sect of PS, and briefly, dramatically threatened to stay in the Parasite (essentially dying, in the fiction of the game). She has since directed several Squids toward an interest in critical theory and transmedia game studies. Hsu emerged in character as Penny Smahls to deliver a brief speech congratulating the now-initiates for successfully collecting the items and finding the Parasite, a goal they had only sort of achieved—the Parasite had been at the museum, but it disappeared before the students arrived. In the end, the technical completion of the game's narrative turned out to be less important to the students than what came next: In light of the contentious rift between Ana Mead and Jesse, the rest of the society (and the design team) had explicitly abdicated control to the freshmen. PS belonged to them now. More than 600 students participated in The Parasite’s live events, though many of them were largely unaware of the full extent of the game. About 150 were Squids, and 20 of those were the core members who pushed through most of the puzzles and found themselves at breakfast the day after the game ended with Weston and designer Derek Chan, grilling Jagoda and Schilt—who made a surprise appearance—about the design process. That’s a hefty number for ARGs: Only about 100 people began playing The Beast within the first few weeks it ran. Still, it didn’t quite live up to the designers’ lofty initial expectations. There were hundreds of small, electrifying moments over the course of the game, many the result of painstaking work by members of the design team on the themes and puzzles most important to them. But several designers also expressed disappointment with elements of the final version of The Parasite, which they perceived as watered down compared to its original ambitions: It lacked narrative cohesion, failed to send students into the South Side of Chicago, and didn’t try to address campus sexual assault. It would be fair to say that, in the course of planning the game, the design team was gripped by dissensus about what they wanted The Parasite to accomplish. Peter McDonald, a graduate student who has worked with Jagoda on several projects, points out that because the events were planned to culminate at the Museum of Science and Industry, there was no real chance the Seekers would fail to collect the objects and find the Parasite—which means, in some respects, there was no way to win or lose The Parasite or for the players to influence more of the outcome. Ben Nicholson, a designer who also helped manage the game, says it was frustrating trying to make such an ambitious project work within the bounds of a large academic institution. The blend of undergraduates, graduate students, and university staff on the design team contributed to stressful working conditions. Behind the scenes the game was like a hectic film set where everything was, of necessity, chaos. And The Parasite was an unequivocal success in at least one regard: bonding students in lasting relationships. The Squids remain a vibrant, tight-knit community, unusual for college freshmen who aren’t thrown together by a club or housing assignments. (Weston’s suggestion that they become interested in transmedia game studies has taken; several of the Squids have indicated that they want to be involved in the creation of the next orientation ARG, if one happens; about half a dozen are signed up to take Hsu’s spring course, “Queer, Quare, Ku’er: or queer of color critique.”) It also includes several of the designers, upperclassmen and graduate students who would ordinarily have kept their distance from first-year students. Several of these more senior designers have already been accepted into graduate programs related to game design. Amazon Studios’ “The Man in the High Castle” take places in an alternate history, set in a post-WWII world where the Axis powers ended up victorious. To create the look of a United States run by Imperial Japan and Nazi Germany, Zoic Studios was tasked with creating difficult visual effects and environment work. Find out how they did it.